Cannabis, the active ingredients cannabinoids, the cancers they might affect, the amount you might take, the balance between the ingredients for optimum results, research evidence and the production of cannabinoids inside your own body and how the receptors there use them; it's all in this overview. Can cannabis and cannabinoids cure cancer? Can cannabis cure cancer? It increasingly looks promising. We have reached a crucial moment in the path of cannabis (marijuana) as a cancer treatment or ’cure’. Over the next 12 months there will be a number of companies - some on the stock market - from Canada to Australia, legally producing medicinal cannabis. Many governments will have to make up their mind. At the moment Spain and Holland allow it medicinally; France and the UK don't. 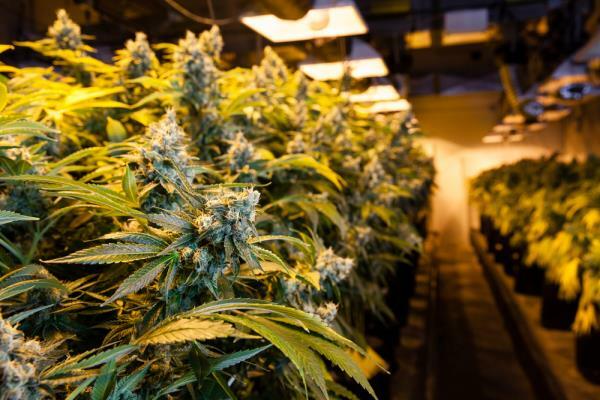 Recently, another has joined the European Cannabis Club, with the Italians asking the Army to produce cannabis for medicinal use - pain relief, MS and cancer being the principal uses (writes Chris Woollams. CANCERactive). Hopefully soon, we will have some stability in a market where currently prices and quality are completely random and the Internet is a minefield waiting to trap the unsuspecting, with money paid and orders not even delivered. Cannabis is actually recorded as a Traditional Chinese Medicine and Medical cannabis, or Medical Marijuana, has been used for centuries being derived from two species of the cannabis genus Cannabis sativa and Cannabis indica. Perhaps the real breakthrough in Medicinal Cannabis came when Dr. Raphael Mechoulam and Yechiel Gaoni of the Hebrew University of Jerusalem, isolated TetraHydroCannabinol (THC) and other cannabinoids from the plant. And then from the brain and other organs in the human body! They went on to show that the human body didn't just make cannabinoids but had natural receptors for the various forms. This is called the 'endocannabinoid system' and there are also two main receptors found in the body - CB1 located primarily in the nervous system, and CB2 located in the immune system, but in times of pain or injury, CB2 receptors are even created and uprated to tissues in which they are not normally found! Their purpose is to calm and protect you. It doesn't stop there. Some (but not all) cancer cells have cannabinoid receptors on their surface! By 1999, researchers in the UK were using THC with Cannabidiol (CBD) in a 1:1 ration with MS patients for pain relief. THC and CBD are not the only ingredients with benefits. For example, Cannabichromene (CBC) and Tetrahydrocannabivarin (THCV) have research on their benefits, and the plant contains Terpenes, known to have health benefits too. Nowadays, experts in Spain like Dr. Cristina Sanchez are adamant that cannabis kills cancer cells, not just in a plastic dish, but in human bodies too. Sanchez, a microbiologist from Compultense University in Madrid, has a great number of very helpful videos (see link below). Importantly, a whole raft of full clinical trials on cannabis is now underway. For example, there's one starting in Australia on adult brain tumours; and one in Colorado where scientists are studying two extracts of cannabis on children with GBM. Another in Israel by Hadassah is looking at 100% pure CBD extract to see if it can stop ’terminal’ cancer. Another from B.C. Canada is a National Trial among cancer patients and comparing 4 groups - High THC, low CBD; Low THC, High CBD; 1:1 THC:CBD; and a placebo. This highlights one of the biggest issues at the moment: No one is 100% sure what the best mix of active ingredients (CBD, THC) is, or what mix of the two plants should be used, or even what size of dose is the correct one for any particular illness. At the end of this article, you will find a link to the International Journal of Cancer Research and Treatment which lists many research studies on cannabis, much of which is very recent. The US Government ’National Cancer Institute’ web site states: The potential benefits of medicinal Cannabis for people living with cancer include antiemetic effects, appetite stimulation, pain relief, and improved sleep. Although few relevant surveys of practice patterns exist, it appears that physicians caring for cancer patients in the United States who recommend medicinal Cannabis predominantly do so for symptom management. So that’s a start - it has official ’approval’ for use with side-effects. Now let's see if we can answer a few common questions about cannabis. Minnesota's Oncology Center have produced a study involving 1,120 cancer patients who took cannabis between 2015 and 2017. Within 4 months of starting the treatment, patients reported reductions in anxiety, disturbed sleep, depression, fatigue pain, nausea, vomiting and a renewed appetite. THC, CBD and other cannabinoids - what's the difference? Cannabis contains over 450 natural ingredients of which at least 80 can be called cannabinoids, the active ’ingredients’ of cannabis. Each seems to have distinct properties: One, tetrahydrocannabinol and termed THC, is the primary psychoactive component leading to a euphoric, even intoxicating state by acting on the Central Nervous System; others like CBD, or cannabidiol, are known to have analgesic and anti-inflammatory effects and to be capable of treating seizures, anxiety and paranoia. Current folklore is that THC causes apoptosis - or cancer cells to self-destruct; whereas CBD destroys the ability of cancer cells to gain blood supplies. Cannabis oil, or hash oil, is a thick resinous oil extracted from cannabis or hemp. This is often the form used as a treatment by ’alternative practitioners’. It has a very high THC content (approximately 70 per cent). Originally solvents used were often inflammable but now recipes (which are common on the Web) use solvents like extra virgin olive oil (see, for example, the Cannabis Chef). Some complementary and alternative therapists argue only for the use of cannabis oil in the treatment of surface cancers like skin cancers. It can however be taken orally. Next, beware the terminology. 'CBD oil' can contain any level of CBD - from 2% upwards to 60%. CBD isolate is almost 100%. You dissolve the latter in olive oil, for the concentration you want. Cannabis and Hemp - what's the difference? It's too easy to think that somehow Hemp (which contains less than 0.2% THC, yet 60% CBD) is the poor relation. Some experts think that CBD is the most active ingredient, while others think it is THC (almost 70% in cannabis), and others think you need to get the balance right depending on what you are trying to achieve. For now, without detailed research, the jury is out. For example, GBM seems to respond better to THC, while there is research showing CBD Hemp oil slows ovarian cancer spread. The cannabinoid CBD has been shown in research to relieve side effects from inflammation and anxiety, to nausea. It has been used in the treatment of schizophrenia. Research shows that this compound also has anti-inflammatory properties. The California Pacific Medical Research Institute looked into the use of CBD with cancer, concluding that it could well be a significant and natural treatment with effect in hard-to-treat cancers. In their various studies, the researchers showed that CBD acted by blocking a gene responsible for metastases - the Id-1 gene - which is responsible for the aggressive movement of cancer cells away from a tumour site. Work has been conducted with both brain tumours and breast tumours. Go to: Cannabis vs Hemp - what's the difference? So how much Cannabis should you take? Again, everyone has a theory. Rick Simpson, who became famous for his THC oil, talked about using a gram to cure cancer. Some experts I know insist that amount would blow your head off and that they have rarely administered more that 0.25 gm, and at that level the cannabis did the job. People talk about taking an amount the size of a grain of rice, putting it under the tongue or on the gums for best effect. Yes, you can use it rectally and many 'experts' do. But Dr. Cristina Sanchez says that all the benefits of all cannabinoids are lost if you use them rectally. Many people prefer to start with CBD oil, and work up in terms of dose, before switching to THC. Others take cannabis (THC) at night before bed and sleep it off, preferring to use CBD Hemp oil by day. Colorado Cannabis Oil is apparently equivalent to the Rick Simpson Oil and costs about $560 for 30 gm, or 30 days supply. Cannabis Oil concentrations vary by state in the USA. What THC to CBD ratios are currently being used? Any and all, is the answer. I help on Brain tumour sites where they talk of pure Cannabis, or 1:! THC to CBD. I know a top UK Doctor treating all cancers with just CBD. I asked someone who helps cancer patients frequently, and they told me 1THC: 4 CBD. I can't help but feel at the moment it's trial and error; and then again rverybody and their cancer reltionship is very individual. There is a 'drug' that Doctors could prescribe since 2010.. It is called Sativex from GW Pharmaceuticals - in Asia, Africa, Japan and China it is called Nabiximols. It contains THC and CBD in a 1:1 rations plus several other cannabinoids. Is there much Cannabis Research to date? Frankly, I found a surprising amount of research reports with ease when conducting my first review of cannabis a decade ago. But it's far from conclusive. Cannabinoids seem to have potential with a great many cancers. Laboratory tests, and confusion over the ratio of the active components being common. And here's the rub. If people are going to marvel that you have CB1 and CB2 receptors in the human body, a lab test of cannabis and cancer cells in a test tube or a petri-dish in effect by-passes those systems and can only show the direct effect of the compound on cancer or healthy cells. A different - and probably better - system is most likely in play in the body. Only a proportion of cancer cells themselves have CB receptors. As I said above, real Clinical Trials are just getting started. The International Journal of Cancer Research and Treatment has a list of research studies - Click here to read more. Importantly, cannabinoids seem capable of working on their own and/or even enhancing the properties of certain drugs. However, it is known that there is also conflict with some drugs, and again, research is in its infancy. 1. Cannabis and Colorectal Cancer - Research studies have suggested that phytocannabinoids and endocannabinoids may be useful in the prevention and treatment of colorectal cancer (1). 2. Cannabis and Lung Cancer - Another study in vitro and in vivo related to lung cancers (Br J Pharmacol 148 (2): 123-35, 2006). In 2007 a Harvard study concluded that ’THC cuts tumour growth in common lung cancer in half, and significantly reduces the ability of the cancer to grow’. The study was done in both laboratory and mouse experiments, with EGFR-expressing lung cancer. Interestingly, this was found to have both CB-1 and CB-2 receptors and researchers concluded that THC modified and blocked these receptor sites that normally stimulate cancer cell growth. 3. Cannabis and Brain cancer (GBM) - Further studies, for example one reported in 2008 in Journal of Clinical Investigation, showed that THC could possibly be used to treat brain cancer as it induced glioma death in laboratory experiments. This supported a previous study by Complutense University in Madrid and the University hospital of Tenerife and published in the medical journal ’Cancer Research’ on August 15th 2004. In this study researchers showed that cannabinoids could stop the action of Vascular Endothelial Growth Factor (VEGF) which is needed by cancer tumours to promote blood vessel growth. The research looked at glioma brain cancer (GBM), but was extended to other cancers where blood vessel growth was essential. In 2014 research from St George's Hospital, Tooting, London, researchers showed that treating GBM with radiotherapy and the two cannabinoids THC and CBD could reduce tumours by up to 90% in mice. By using the two compounds in combination, a lower dose of cannabinoids could be used. 4. Cannabis and Leukemia - Lead researcher Dr. Liu in the GBM study above, also took 6 different cannabinoids (but not THC) and showed they could kill leukemia cells. He felt their action could work on any cancer. He also stressed that he did not think smoking cannabis would have the same effect! 5. Cannabis and Breast cancer - In Molecular Oncology (2015) it was shown that a proportion of HER2 and TNBC cancers contain CB receptors actually on the cells themselves. Researchers showed that CBD could inhibit EGFR and growth of the cancer cells.Researchers at the Virginia Commonwealth Medical School have also shown effect of CBD and THC with HER2 and TNBC breast cancer, and benefits in reducing nausea and vomitting during chemotherapy. There is also research with ER+ve breast cancer suggesting that patients do best with a 1:4 THC to CBD ratio. Several studies suggest that THC works best at inducing apoptosis and limiting tumour growth; while CBD limits metastases in ER+ve breast cancer. 6. General Cannabis benefits - A great many of the studies claim that cannabinoids may cause antitumor effects by various mechanisms, including induction of cell death, inhibition of cell growth, and inhibition of tumour angiogenesis and metastasis (for example, Nat Rev Cancer 3 (10): 745-55, 2003; FASEB J 17 (3): 529-31, 2003.; Br J Pharmacol 144 (8): 1032-6, 2005) Importantly, there is much research comment that cannabinoids appear to kill tumour cells but do not affect surrounding healthy cells. In another study (Natl Toxicol Program Tech Rep Ser 446 (): 1-317, 1996) using THC, liver cancers, and benign tumours in areas such as the breast were noted to decrease in line with dosage. One World Cannabis, an Israeli-based developer of cannabinoid therapies have tried various balances in different formulae to deliver a significant effect against multiple myeloma. Clinical Trials Phase II are just beginning. There are already Biotech companies looking into cannabis. For example: There is one in Denver called Cannabis Science Inc claiming that numerous patients are reporting that Cannabis Science extract treatments are killing cancer cells. They have a Colorado-licensed dispensary and are pursuing Clinical Trials with the FDA. It is worth noting that a common finding in my research trawl on the pages of the more staid health bodies and charities was this: "Research from New Zealand concludes that smoking cannabis is 20 times more dangerous to your health than smoking cigarettes. Indeed, many cancer charities, when you search for cannabis and cancer, actually dwell on this research over anything else even remotely suggesting benefit!" How can I find out more about cannabis? Rick Simpson is a colourful character who used Hemp Oil to beat his cancer and he has spent many years perfecting the treatment process See http://phoenixtears.ca). His protocol is now perfected. He does not supply hemp oil himself but beware because a number of companies seem to pass off product as if it were his. One we have received testimonials about is this: Drricksimpsonmedicals@outlook.com. We cannot vouch for it, and you will have to check your legal position.